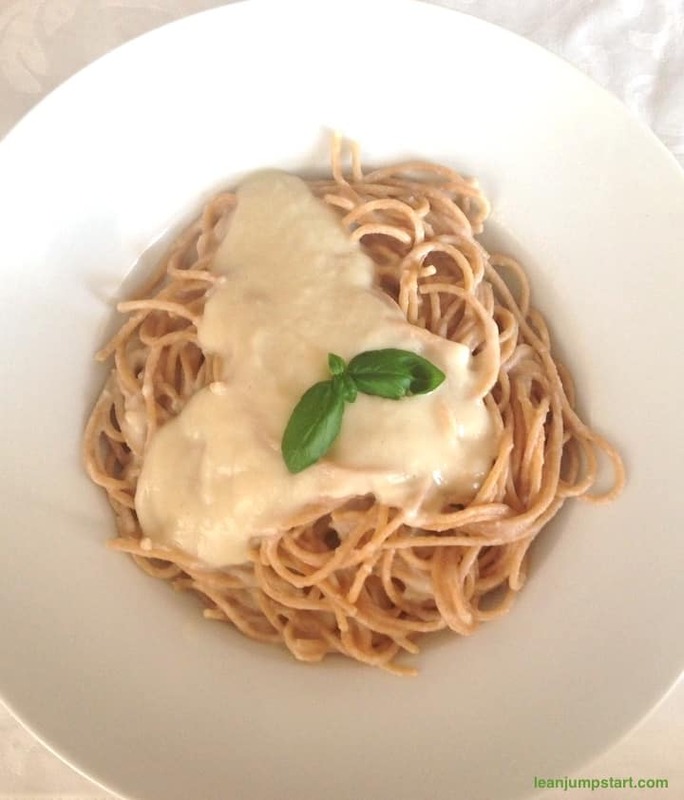 Here comes an easy Alfredo sauce recipe – vegan style, which I tested out recently to have another simple pasta sauce for my daughter. Once you are used to eating clean, it is quite simple to turn dishes into a vegan version. 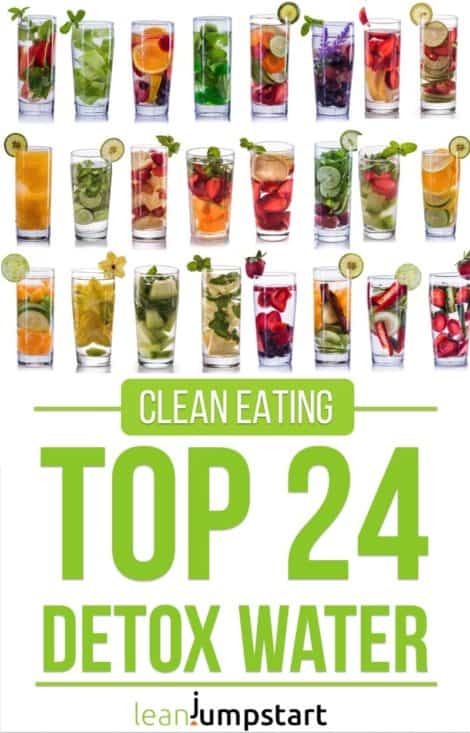 Most of my clean eating recipes are anyway plant based and that way vegan by nature. A rich and creamy Alfredo pasta sauce is traditionally made with lots of butter, heavy cream, mascarpone, and Parmesan cheese. In consequence, it is a fat and calorie rich pasta companion. Some chefs even add eggs to the sauce. 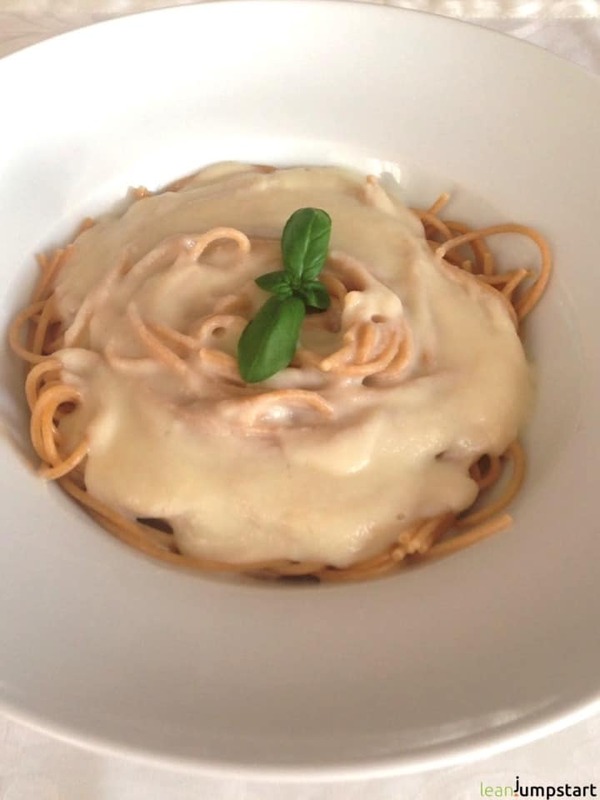 Maybe you know the famous Italian dish, called “Fettuccine Alfredo”. The Canadian Angela Liddon (ohsheglows.com) was sharing this recipe on her food blog some time ago. It is a plant-based alternative to this famous pasta sauce. Angela had the really ingenious idea of using cauliflower as the basis for her creamy sauce. This lighter, dairy-free sauce is just as smooth, has much fewer calories and actually consists almost exclusively of fresh vegetables! I changed and simplified Angela’s recipe a little bit according to my preferences. Of course, I used also whole grain spaghetti (didn’t have Fettuccine) instead of plain pasta to give this dish an even higher fiber content. If you can get whole grain Fettuccine or broader wholemeal noodles, then the thick sauce could even better stick on the pasta. My daughter would probably prefer the plain pasta version, but she accepts our whole grain compromise. She knows my opinion on this in her sleep: “While plain pasta is, in fact, animal-free, it is based on white flour (refined carbs) and far away from being beneficial for our system. Whole grain pasta is the better, fiber-rich alternative with complex carbohydrates”. As much as we try to please her with delicious vegan recipes, she knows that she has to please us with our more health-conscious, clean eating approach. Ok, let’s come back to the simple cauliflower sauce recipe. Sauté onion cubes in it over medium heat for 4 minutes. Then remove from pot and put aside. 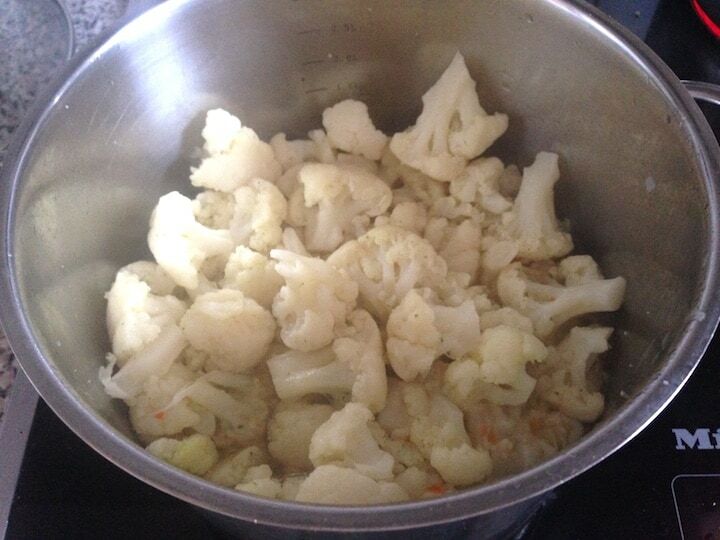 Cook cauliflower florets in vegetable stock for 10 minutes over medium heat until firm to the bite. In the meantime bring enough salt water to a boil for pasta and cook it “firm to the bite.” according to instructions on the packet. Remove 100 ml of broth. Puree cooked cauliflower florets with remaining vegetable stock, onions, garlic, milk, nutritional yeast flakes, lemon juice and salt in a food processor. 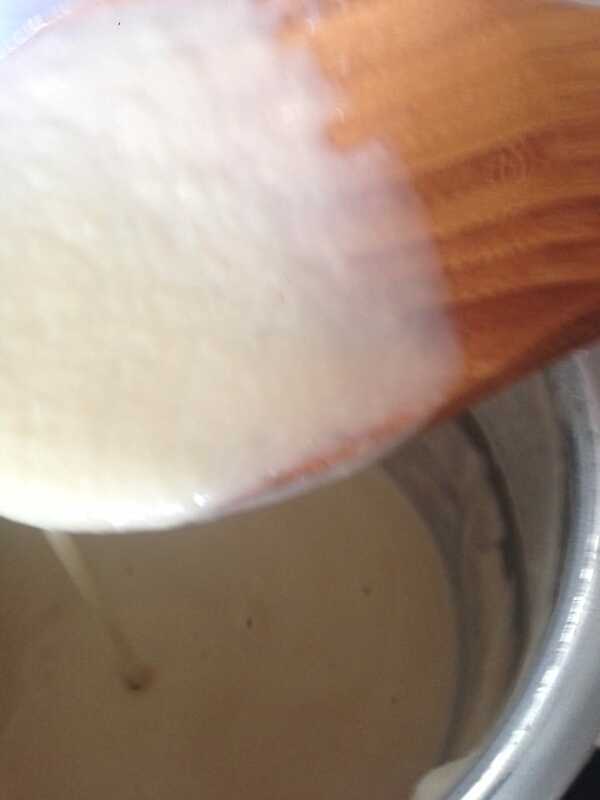 Return the cream sauce to the pot, bring to a boil for a moment and then simmer over low heat for 2-3 minutes. Mix the drained pasta with sauce and yeast flakes and garnish with basil leaves or coarsely chopped parsley. The best homemade Alfredo sauce recipe for me is one which is creamy, has a garlicky taste and ideally doesn’t make you fat. 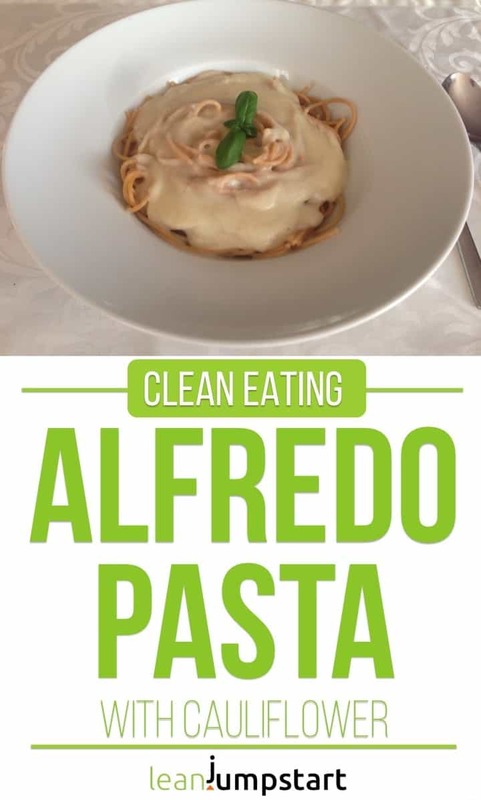 Luckily this easy Alfredo sauce recipe has it all! If you prefer a vegetarian version you can use regular milk instead of almond milk or soy milk and still benefit of a light pasta sauce. You can also use vegan butter instead of the canola or olive oil, but it is usually more processed than the oil. You can easily pimp up this sauce with adding mushrooms or steamed broccoli and serve it to brown rice. If you don’t have to watch your weight you can add 1/2 cup of soaked cashews to the food processor for a result that is even creamier. For an extra protein and fiber-rich sauce, you might want to experiment with the versatile white beans.